Before this summer, who knew that Folkestone had a lighthouse? Stuck at the end of an abandoned railway line in the town’s less than glamourous harbour area, many of us had just never noticed. That all changed in August of this year though when the season’s runaway success, the newly restored Harbour Arm, brought the chunky polished granite beacon to our full attention. Despite years of investment and regeneration in the Creative Quarter, it has been the Harbour Arm with its stylish lighthouse that has finally drawn the crowds to Folkestone. All kinds of people (local and visitors) enjoying food, music, film, the vibrant atmosphere and fantastic views together – in a place that once epitomised the town’s hopelessness. Who’d have imagined this 20 years ago? Ten, even? Mr de Haan certainly has vision. The lighthouse itself was built around the turn of the 20th century on the railway pier, replacing an earlier construction. In a very different age, trains including the Orient Express would board ferries at Folkestone Harbour Station and depart for the continent. It was also, less romantically and more poignantly, the gateway to the trenches in World War I. Troops were given their last cup of tea here in the Mole Cafe before heading across the Channel and over the top. The cafe was run by sisters Florence and Margaret Jeffrey who kept eight volumes of visitors’ books between 1915 and 1919. Those pages can now be read on the Step Short website. What an amazing piece of local history. By 2001 the war was long gone, the British seaside was in a depressing state, ferry services had ceased and the station was closed to regular passengers – though the Venice Simplon Orient Express continued using Folkestone Harbour Station as a drop-off point for passengers transferring to the Channel Tunnel until 2009. Almost forgotten at the end of the derelict pier, and unseen by most visitors, the lighthouse stood firm and bided its time. The building was Grade II listed in 2008 and completely refurbished by the Folkestone Harbour Company in 2011. A new era was just around the corner. During the noughties the Creative Foundation had set about transforming the Old High Street, Tontine Street and the harbour with grim determination, and a lot of cash. 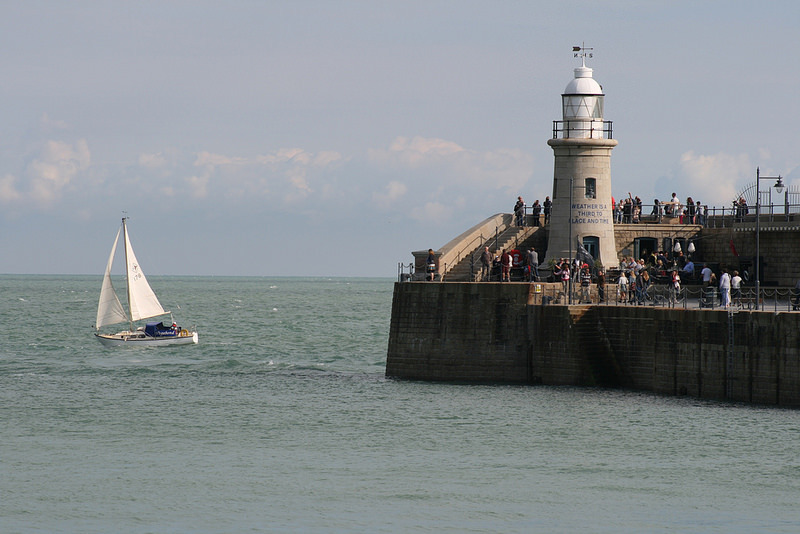 The Harbour Arm’s lighthouse became a piece of art in 2014, featuring in the Folkestone Triennial when it was inscribed with the words of the late artist Ian Hamilton Finlay. ‘Weather is a Third to Place and Time’ refers to the importance of the weather to all who work at sea, and also to its relationship with place and time for us. After much debate about the harbour railway line’s future (with some campaigners lobbying for a rather fusty sounding heritage train attraction), it was formally closed in July 2014. Now creative and ambitious redevelopment plans for the harbour and seafront are moving full steam ahead. And they are definitely not fusty. As anyone who lives in the Folkestone area knows, the Harbour Arm reopened in August 2015 after a £3.5 million refurbishment. In a relatively short season (opening on Friday, Saturday and Sundays until the end of October) the Harbour Arm has really taken off. 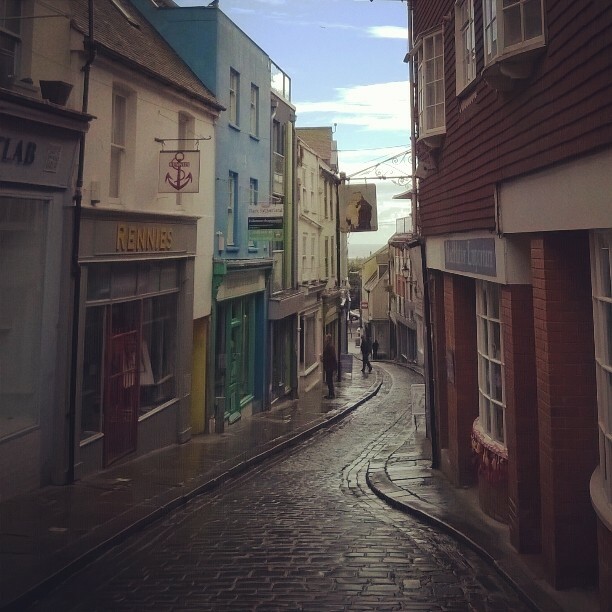 People love it, and it feels like something is finally happening in Folkestone. Live music, open air cinema, art and cultural events, pop-up food stalls from the town’s growing community of fantastic restauranteurs…it’s positively buzzing. I can’t wait to see how it evolves in 2016. The Harbour Arm closes for the 2015 season on Sunday 25 October. 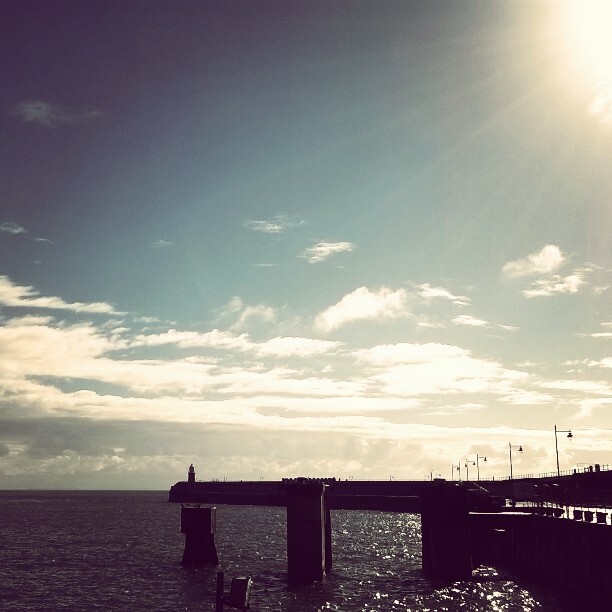 Make sure you take a stroll along the old pier and look at Folkestone with a new perspective. Sip champagne in the lighthouse bar and raise a glass to everyone who has passed by this beautiful beacon in its 100-or-so years. Things are looking up. 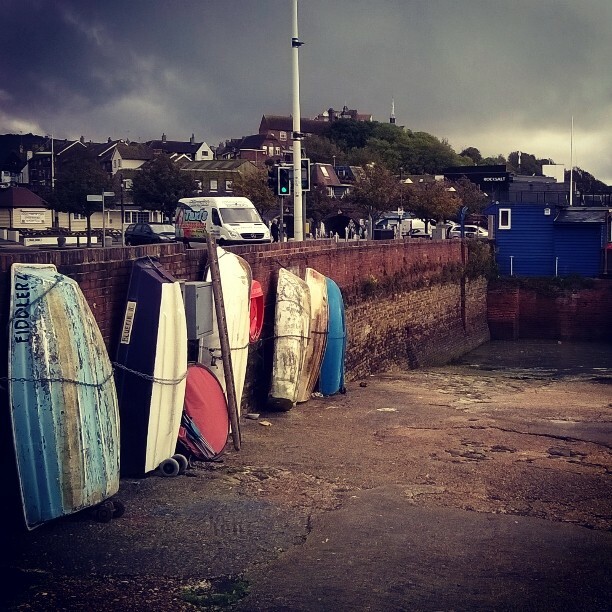 Previous Article Hythe: Hipster Haven?